Halloween is not complete without a fun and spooky drink in a jar. I couldn’t leave Halloween mason jar week without sharing this amazing Halloween white hot chocolate recipe. Grab the ingredients to mix up a mug or two of this fun treat for your little ghosts and goblins. If you have missed any of Halloween mason jar week, we have had some amazing ideas from our partner blogs. You can head on over and check out the ideas from day 1, day 2, and day 3. Then be sure to scroll to the bottom of this post for the links for today’s Halloween mason jar crafts. I love Halloween and jars so this week is just perfect for me! Heat milk on stove until warm. Whisk in white chocolate until melted. Remove from heat and add vanilla and food coloring. Add food coloring until your white hot chocolate is the desired color. Pour into a mason jar mug. One recipe makes enough to fill one of these mugs. Drizzle with edible green slime (recipe below) and serve! Mix corn syrup with green food coloring until the desired color is reached. Start by adding 1 tsp powdered sugar and mix well. Add more until desired consistency is reached. This makes enough drizzle for 3 to 4 mugs of hot chocolate. This drink will warm you up on a cool Halloween night! 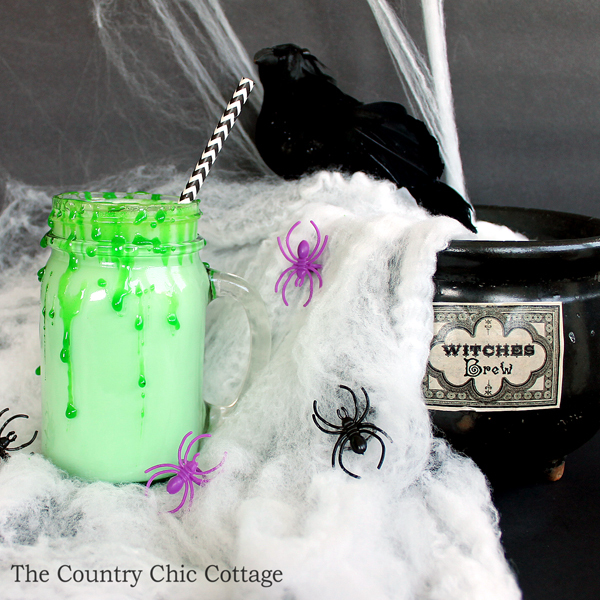 Plus the fun green color will make all the kids think they are drinking something extra spooky. 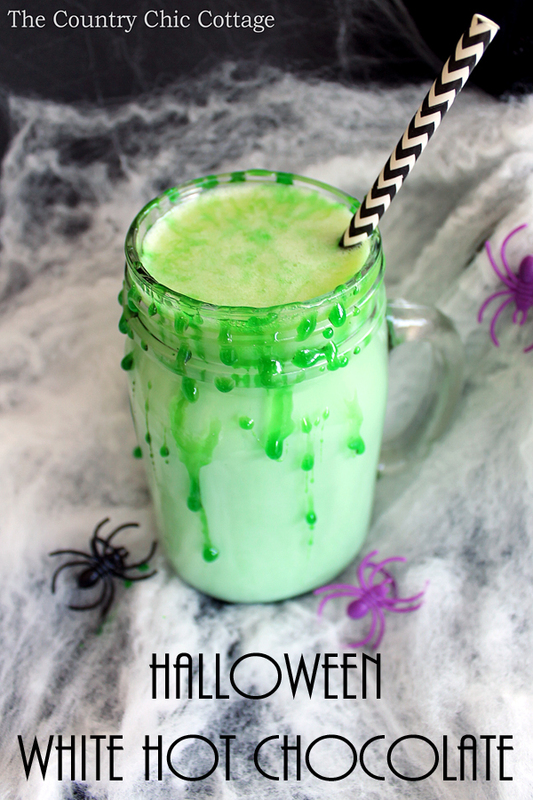 The green slime drizzled on top and on the sides really sets off this fun Halloween drink creation. Be sure to make this Halloween white hot chocolate recipe every year! Now for some more Halloween mason jar crafts from our partners for this series. What a fun idea! The green slime is a great addition. I found you on Made by You Monday! This is so cute! I love the edible slime. I can’t wait to make it with my kids. Thanks! This is too cute, Ill have to make some for Halloween night because it gets so chilly out there! I absolutely love the slime! My kids would definitely think this was cool. Pinning, stumbling, and yumming. What a very special treat, we will love your Halloween White Hot Chocolate. Thanks so much for sharing with Full Plate Thursday and have a wonderful day. The slime makes me think of ghostbusters. I think it will be extra popular next year, after the ghostbusters reboot!